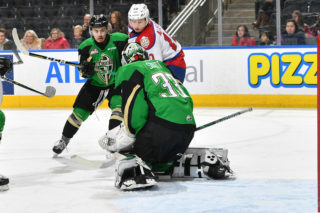 Edmonton, AB – The entire Edmonton Oil Kings organization would like to say thank you to YOU – the fans for your support in our historic 2011-12 Season! 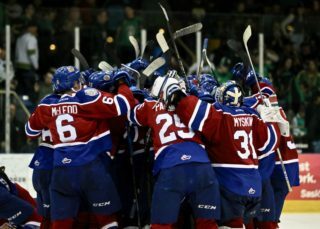 The team set several new club records and with your support captured the 2012 WHL Championship! 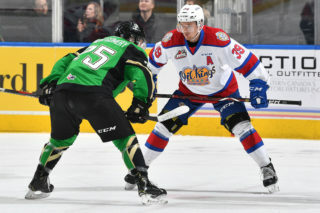 This was the first time in modern franchise history the Oil Kings raised the Ed Chynoweth Cup as the WHL Champions and marked the team’s first trip to the Memorial Cup in the modern era. Following the season the Oil Kings were invited to City Hall for a special celebration in their honour. Mayor Stephen Mandel and other dignitaries took part in the event as May 30, 2012 was officially proclaimed Oil Kings Day in Edmonton. After the formal part of the event, Oil Kings players and students from Donnan Elementary School’s hockey program took part in a fun street hockey game on 102A Avenue. The team held their annual awards night with several players adding to their 2011-12 hardware. The Greg Tomalty Trophy for the Oil Kings MVP was awarded to New York Rangers draft pick Michael St.Croix. St.Croix was also the recipient of the Oil Kings Top Scorer award with a modern franchise record 105 points in the regular season. 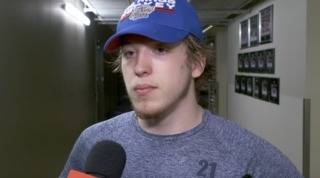 Past Greg Tomalty Memorial Trophy Award winner Mark Pysyk was selected as the Oil Kings Top Defenseman for the fourth straight year. 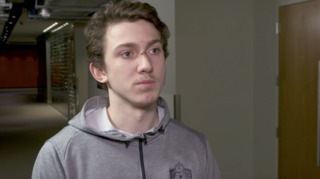 Pysyk, a Buffalo Sabres draft pick, was also selected as the 2011-12 Humanitarian of the Year. Don’t forget that season tickets are on sale now for the 2012-13 season of Oil Kings Hockey! 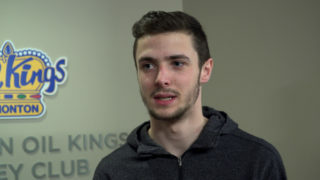 With nearly all the WHL Championship team returning the Oil Kings will try to become the first back to back WHL Champions since the 93-94 and 94-95 Kamloops Blazers.